The US used to be able to do things like this…Before conservatism and racism took the country down. Because having the third-tallest building just isn’t good enough. Saudi Arabia’s aspirations are rising to dizzying new heights as the country finalizes plans to construct the world’s tallest building — one that will shadow the United Arab Emirates’ current record holder, the Burj Khalifa Tower in Dubai, by 565 feet. 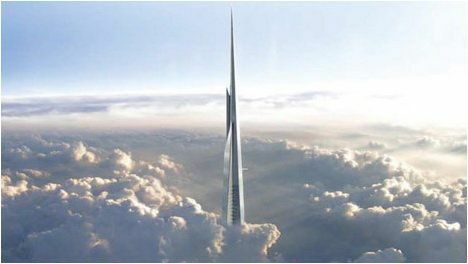 The 3,281-foot Jeddah Tower, also known as the Kingdom Tower, is slated to become the first building in the world to stand one kilometer high upon its expected 2020completion. Construction is already underway, up to the building’s 26th floor. The 170-story structure in Jeddah will overlook the Red Sea and will feature a hotel, offices and apartments, as well as the world’s highest observation deck on its 157th floor. That’s 55 stories taller than One World Trade Center’s highest observatory in New York City. On Sunday, the Saudi government announced that Jeddah Economic Company and Saudi Arabia’s Alinma Investment had secured funding to complete construction after striking a $2.24 billion deal for the tower and surrounding real estate projects. Saudi Arabia currently boasts the third-tallest building: the Makkah Royal Clock Tower Hotel, a 1,972-foot-tall architectural marvel located in Mecca. It was the world’s second-tallest building until the completion of China’s 2,073-foot Shanghai Tower in September. But those record holders are already in the process of being displaced by China’s Suzhou Zhongnan Center, which will stand 2,392 feet tall upon its completion, and Indonesia’s Signature Tower Jakarta, slated to stand 2,093 feet tall.